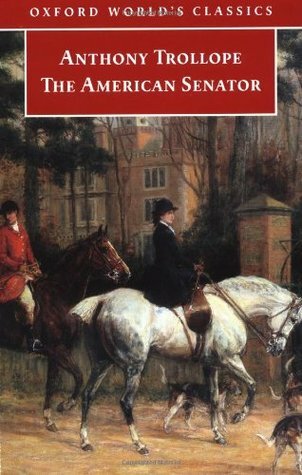 The American Senator is the fourth Trollope I have read and likewise picked it up simply because I stumbled upon a paperback copy that whose condition I wouldn't have to worry about. Once again, I became quite quickly enveloped in Trollope's detailed prose and engrossing settings. Though called The American Senator, the story begins and is ultimately founded on the town of Dillsborough. We follow several members of the gentry as well as several who want to become or were once close to the gentry. It starts off with a bewilderingly complex pre-history of the lord and manor hall of the county that Dillsborough is in, but we soon settle down to Lord Morton, a diplomat who has returned to his family seat where he never grew up, his insanely snobby grandmother and his unknown cousin Reginald (whose mother was from Montreal and thus hated by Lord Morton's grandmother). The Senator in question is a guest of Lord Morton and goes around interrogating everybody and then criticizing England in a way that tends to put people off. Sir Reginald is a loner and quite content to read books and wander around the family land smoking his pipe. He also secretly is in love with Mary Masters the angelic daughter of the ex-family lawyer to the Mortons (the third generation of lawyers to them who was unceremoniously fired by the previously mentioned grandmother). As I say, complex. Two other important storylines are the laying down of poisoned herring in an fox-hunting wood during a lawsuit between a poor farmer and the neighbouring Lord Rufford (readers will know this is the stuff I really love) and the pursuit of said Lord Rufford by Arabella Trefoil. This latter is ostensibly engaged to Lord Morton but is a career husband-hunter. Much of the plot is how she juggles between pursuing Lord Rufford while being engaged to Lord Morton. Finally we have the senator himself. He is a guest of Lord Morton initially. His whole deal is to learn about British institutions and then diss them. He is often correct in his theoretical positions but almost deliberately blunt and ignorant of the customs he is violating. He comes off at first as a bit of a caricature of the ignorant and headstrong American, but as you read on, you sense more and more that Trollope is using him as a mouthpiece to expose some of the absurdities of english law at the time. I enjoyed this book for the most part, but had some reservations. I found that the subtext here was more conservative than past Trollope books I read. He lampoons the aristocracy but also seems to subtly argue for its ongoing existence. My understanding was that Trollope was quite progressive for his time, but I felt a bit of a lament against change here. None of that reduced my pleasure in the reading and I may be offbase. However, the romance here was a bit simplistic and also hinged on for me an unbelievable lack of communication. It dragged the tension on unnecessarily long which I found manipulative and in contrast to the deft way he goes beyond that kind of narrative trickery in Barchester Towers. That being said, the final conclusion of the romance had a slight wrinkle that went some way to make it more interesting than it promised to be during its unfolding.